Click Here to Buy the Blackbird or its Accessories! 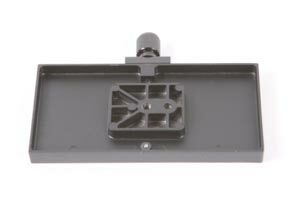 The advanced design Blackbird camera stage has adjustment knobs for precise x-y positioning of the camera allowing easy camera leveling that is comparable to stages on equipment costing many times more. Low backlash screw drives combined with precision internal dovetail guides ensure rock solid camera positioning that doesn’t shift in use. Built in tilt and roll bubble levels provide helpful indication of camera horizontal plane position during horizontal balancing. 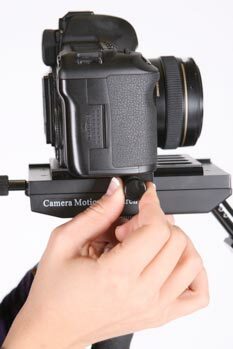 The camera is first attached to the dovetail camera mounting plate which has a durable friction pad that provides secure camera mounting with or without use of the camera locating pin (not used for DSLR cams). Then the camera mounting plate drops into the Blackbird camera stage and is securely locked down with a thumb screw clamp. 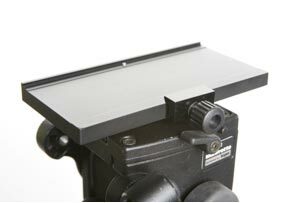 The camera mounting plate can be moved forward or back to provide additional front to back level adjustment and engages a safety pin to prevent sliding off the stage during adjustment. 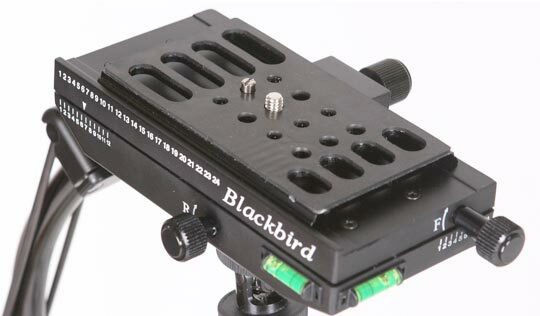 The Blackbird stage has a convenient scale to reference the camera mounting plate position to minimize re-balancing time when attaching your camera. The main operator control ring for roll, tilt and pan is located above the gimbal and a second ring below the gimbal provides useful “pan only” control. The ergonomic padded handle allows a firm and comfortable on-axis grip to support the weight of the Blackbird and camera. The CMR patent pending SmoothTouch technology provides user adjustable friction in the tilt and roll directions. Conventional wisdom with regard to gimbal friction was that the lowest possible friction is desired in order to isolate the operator’s rotational hand movements from the stabilizer. In fact the Blackbird gimbals are probably the lowest friction in the industry. Actually low gimbal friction has a drawback, which is un-damped motion. In plain language once a roll motion is started the stabilizer will pendulum quite freely unless controlled by a skilled operator. However a controlled amount of frictional damping in the gimbal can be very effective in reducing roll and tilt motion artifacts without noticeably affecting isolation from the operator’s hand. And controlled gimbal friction reduces the initial stabilizer motion from accelerations that causes pendulum action. For outdoor shots gimbal friction reduces the effect of wind. 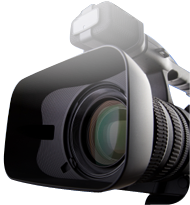 In order to be effective, gimbal friction must be constant and smooth, and it must be operator adjustable for different camera weights. That’s what the CMR SmoothTouch technology achieves and the result is better shots at all operator skill levels. Obtaining correct vertical balance or "drop time" is essential to good stabilizer performance. 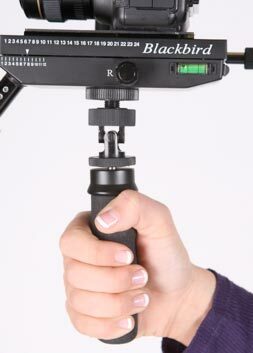 No stabilizer can beat Blackbird's ease of adjustment of drop time for different camera setups. Cameras weighing from less than 1 lb. and up to 8 lbs are balanced by first adding appropriate counter-balance weights according to the Blackbird guide for camera weight (or just taking a guess). The counterbalance weights are dropped in or removed by loosening the counterbalance weight locking nuts. Next a finer adjustment of vertical balance is achieved by moving the counterweight T-bar up or down. The T-bar locking lever provides fast secure locking with an advanced clamping design. Getting the right vertical balance will require one or more quick horizontal balance adjustments. 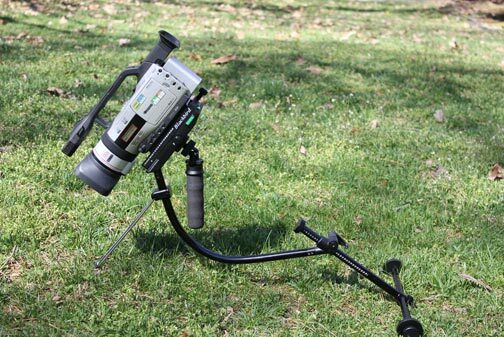 Additionally, the gimbal vertical position can be adjusted by loosening the gimbal locking nut and rotating the gimbal up or down. The procedure for obtaining correct vertical balance is easy and can be done in just minutes for any camera. For cameras weighting less than about 2 lbs the gimbal extension may be used. 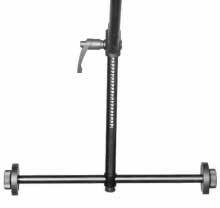 The horizontal counterweight bar is normally positioned side to side to allow holding the Blickbird close to the body but can be positioned front to back for shots requiring holding the stabilizer to either side of the body. The excellent Blackbird performance is maintained with the horizontal bar in any angular position. To provide maximum pan axis moment of inertia and stability the standard 11 inch horizontal weight bar can be easily replaced with the supplied 15 inch horizontal bar. All accessories are included with Blackbird Full Kit or any may be ordered with Blackbird Basic. 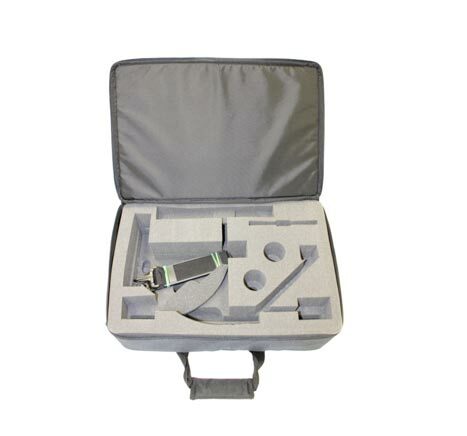 The Blackbird custom soft carrying case with die-cut foam padding provides convenient and safe storage and transport of the Blackbird and all accessories. To allow the Blackbird to be compactly stored in the case the T-bar is easily separated from the stabilizer chassis. The Blackbird improves on its industry leading operator convenience with the addition of the resting stand. For the first time with any handheld gimbal stabilizer you can set down the stabilizer with camera attached on any reasonably flat surface in a stable and safe position. For normal flying the resting stand is folded down. When you’re not shooting (or to give your arm a rest), just flip up the stand and set your rig down. The resting stand is engineered with stainless steel and anodized aluminum components to make it strong and light without compromising the Blackbird flying experience. The Universal docking bracket can be used to conveniently dock (or balance the camera on) the Blackbird using either a tripod, a C-stand, or on any table edge using the included table clamp. Table Clamp: maximum open clamp adjustment 1 ¾ in. 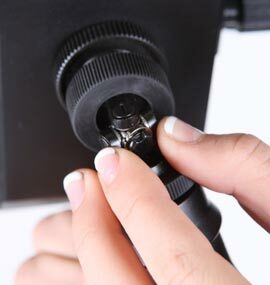 The tripod adaptor mounts to the top of your tripod (standard 1/4-20 female connection with locating pin hole). It has the same dovetail and clamp design as the top of the Blackbird camera stage. 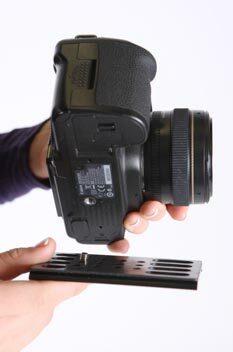 So with the Blackbird camera mounting plate attached to your camera you can quickly change between Blackbird and tripod. 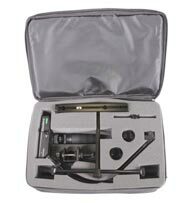 The Blackbird Full Kit includes the stabilizer with both 11 in. and 15 in. 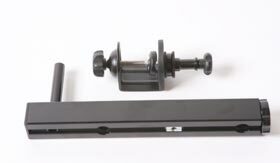 horizontal bars, camera mounting plate, gimbal extender, complete counterweight sets, spare camera mounting screws and locating pin, user manual and 70 minute instructional DVD, universal docking bracket, resting stand, tripod adaptor, and short vertical bar. Camera payload: 1 to 8 lbs. Case dimensions: 18 in. x 12 in. x 6 in.